Guard Dog ammo employs a full-metal-jacket bullet that feeds like a dream and, unlike traditional FMJs, also expands, which makes it a great home-defense option. There are good reasons for using full-metal-jacket ammunition. In some handguns, it is what feeds most reliably. I don't care that a particular jacketed hollowpoint might act like a tactical nuke on arrival; if it won't feed in the handgun I have, it's not going to do me any good. But reliable feeding can be fixed- if you're willing to pay to correct it and feel that particular pistol is worth the effort. Modern FMJ ammunition is rarely inaccurate, even if it isn't gilt-edged in grouping. The real problem with FMJ ammunition is that it has a well-deserved reputation for excessive penetration. Federal now has a way for you to have your cake and eat it, too. The new Federal Guard Dog ammunition is both full metal jacket and expanding. How does the company do this? The front core of each bullet is not lead but polymer. The pre-stressed jacket contains the polymer front half and lead back-half core, and the lack of an opening provides a slick feeding surface. On impact, the jacket begins to bend, as the polymer section beneath it cannot support the impact load. The lead core continues to drive the bullet forward, and the result is a bullet that expands. Hollowpoints expand by the expansive force of whatever is inside the opening pressing the sides outwards. The problem, for a long time, was that the hollowpoint could become clogged with material from intermediate obstacles, and the plugged hollowpoint would not expand. It took a lot of work to come up with just the right design, material and shape to consistently expand. Expansion of the Federal Guard Dog bullet begins as soon as the bullet strikes an obstacle, as the compression of the polymer interior is what initiates expansion. The shape of the jacket containing the polymer interior is what controls the amount and uniformity of expansion. I'm sure someone will connect the dots, and remark "But that means it is expanding even as it strikes a wall, door, glass or other obstacle." Exactly. Federal views the role of Guard Dog as home defense, where you in most cases you need to be very concerned about over-penetration because of what might be on the other side of an interior wall. You'll notice that the weights of the Guard Dog bullets are below the customary standard for a given caliber. This is a result of two inescapable physical limits: polymer is less dense than lead, and velocity drives bullet expansion and deformation. For example, in the 9mm, we have a 105-grain bullet that is longer than a 125-grain bullet. Were Federal to try to make it 125 grains in weight, it would probably as long or longer than a 147-grain bullet, which would result in stability problems. And the velocity might be so low- especially out of compact carry- guns) that expansion would suffer. In addition to the 105-grain 9mm there are 135-grain .40 S&W and 165-grain .45 ACP offerings in the Guard Dog line. I started my test with full-size 1911s in order to get full velocity from the ammo and to see what kind of accuracy I could get with good triggers and long sighting radii. Recoil for the 9mm was quite mild in the all-steel test pistol. Ejection was gentle, and the brass didn't go very far. In a compact carry pistol, a 105-grain bullet trying to do more than 1,200 fps is going to be a bit snappier. In .40, the recoil was more like what I expected. A 135-grain bullet at nearly 1,250 fps makes IPSC Major, and the felt recoil reflects that. While it was not a problem in the Infinity 1911, out of, say, a Ruger SR40c it would probably be a handful. In .45, the 165-grainer running just over 1,000 fps produces an interesting effect: On paper the recoil should be greater, but in the hands it felt milder than the .40. I did a quick-n-dirty field test in water. There, I found that the expansion of Guard Dog bullets was as uniform as you could possibly desire and would put its penetration in gel at just about 12 inches. I also tried the Guard Dogs through a piece of marine plywood backed with water. While not as photogenically expanded, the bullets still expanded and penetrated well. I think Federal has come up with a clever way to get expanding-bullet performance from a projectile that acts in all other aspects just like FMJ. It would be worth your while to get some and see how it functions in your favorite pistol. 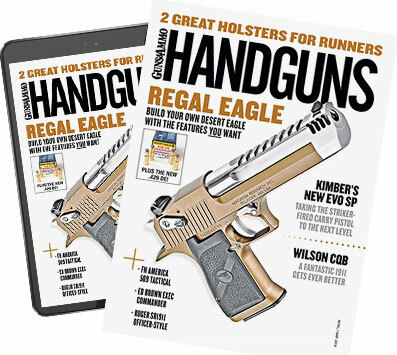 The full text of this article will appear in the April/May 2012 issue of Handguns magazine.